HUNTS POINT — FreshDirect’s planned move to The Bronx, aided by $130 million in public subsidies, whipped up controversy from the moment it was announced in February. The most ardent opponents of the plan, a coalition of Bronx residents and activists called South Bronx Unite!, disrupted the subsidy hearing, called for a FreshDirect boycott and filed a lawsuit to block the move to Port Morris, claiming the company’s delivery truck fleet would pollute the neighborhood. 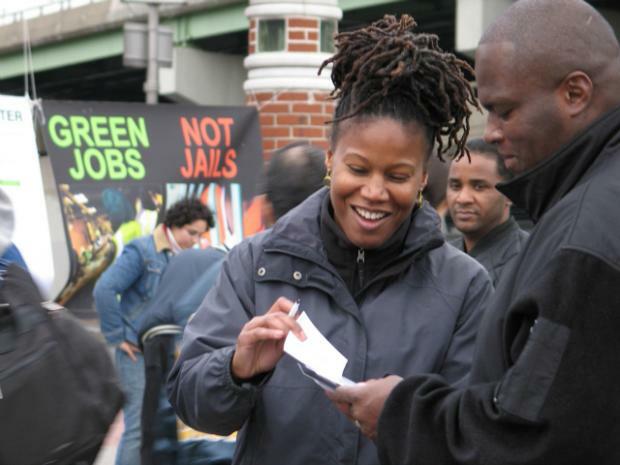 In an effort to counter this bad publicity and foster local support for the project, FreshDirect recently made a bold hire — Majora Carter, the award-winning environmentalist who founded a green jobs nonprofit in Hunts Point and now runs a for-profit consultancy. On Thursday, Carter made her first public move on the company’s behalf when she convened a closed-door meeting between an array of Bronx nonprofit leaders and FreshDirect’s CEO, Jason Ackerman. Several of the meeting participants commended Ackerman and the company for engaging directly with local leaders and said they appreciated Carter’s role in facilitating the confab. But members of South Bronx Unite!, who did not receive an invitation from Carter but still sent two representatives to the meeting, quickly took to social media to denounce the partnership between the green guru and a company they consider decidedly un-green. “Majora Carter has sold out to FreshDirect and has abandoned the people of the Bronx,” Ed García Conde, a Bronx blogger, wrote on Facebook. “@FreshDirect’s [South Bronx] plan is so toxic they’ve bought @majoracarter,” another South Bronx Unite! member, Monxo Lopez, posted on Twitter. James Chase, Carter’s husband and spokesman for the consultancy, the Majora Carter Group, dismissed the critics as “counter-productive” and said that Carter spent several weeks this summer “kicking the tires” at FreshDirect before signing a one-year contract to help the company connect with local groups. “FreshDirect’s corporate practices, from what they told us, seemed really, really in line with Majora’s values and have a lot of benefits for the South Bronx,” such as increased access to healthy food and good jobs, Chase said Friday. At the meeting Thursday at the BankNote building in Hunts Point, FreshDirect’s Ackerman presented a PowerPoint presentation about his company’s planned relocation to a group that included representatives from Mothers on the Move, the Hunts Point Alliance for Children, Green Worker Cooperatives and Urban Health Plan. He began by acknowledging the company did a poor job reaching out to the community before the project was announced, then launched into a discussion of some of the main points of controversy, such as worker wages, the affordability of the food and the environmental impact of the move, according to several participants. The environmental impact, particularly the risk that greater truck traffic could increase the South Bronx’s asthma rate, which is already eight times the national average, dominated much of the conversation. Ackerman listed several ways the company would blunt the impact of its truck fleet, including by building an on-site natural gas filling station for its trucks and a 125,000-square-foot rooftop garden open to the public, according to Kelly Moltzen, a nutrition coordinator with Bronx Health REACH who attended the meeting. Mychal Johnson, a South Bronx Unite! member and petitioner in the lawsuit against FreshDirect, showed up to the meeting uninvited but was permitted to attend. He and another person raised two concerns about the plan — that FreshDirect relied on an environmental assessment from 1993 rather than conduct a full new one and that the facility would generate more than 1,900 daily vehicle trips. Ackerman told the group that he would have to check into the trip number, but that if the company had to conduct a new environmental review, that would cause a delay that might jeopardize the entire project, according to several participants. FreshDirect declined to comment on the specifics of the meeting, which a spokesman called “private,” but it did release a statement about the gathering. It said the meeting is part of “our ongoing efforts to be an active and responsive member of the Bronx community” and noted that the company recently organized a Bronx job fair and launched a pilot program that allows certain South Bronx residents to order groceries online using food stamps. “We’re going to keep up these efforts as we work to make the Bronx our new home,” it said. FreshDirect expects to open its new 500,000 square-foot facility in The Bronx by 2015. “It’s all talk right now,” she said.